A baja sensation! Zesty lime and spices make this a fun dip for a fiesta dinner. 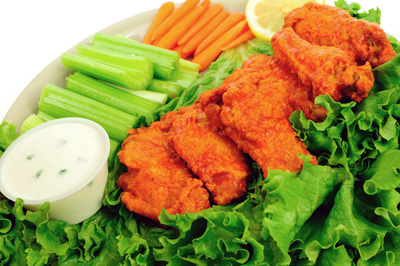 Just Add – sour cream, makes 2 cups of dip. 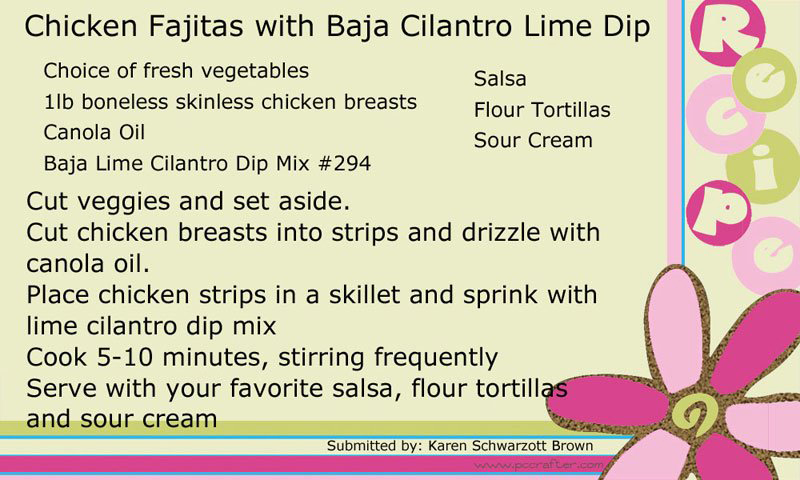 Here is a recipe that uses the Baja Lime Cilantro Dip Mix. Brownie Facts To Sweeten Your Day! A rich home made brownie mix with added chocolate chips for an even richer chocolate flavor.Makes a 8 x 8 pan of wonderful chocolate brownies, just add water. Now On to Brownie Facts to Sweeten your Day! The first brownie ever made, like other culinary mishaps (the sandwich, pizza, potato chip) was actually a mistake. The baker didn’t have baking powder and ended up with an unleavened fudgy treat. 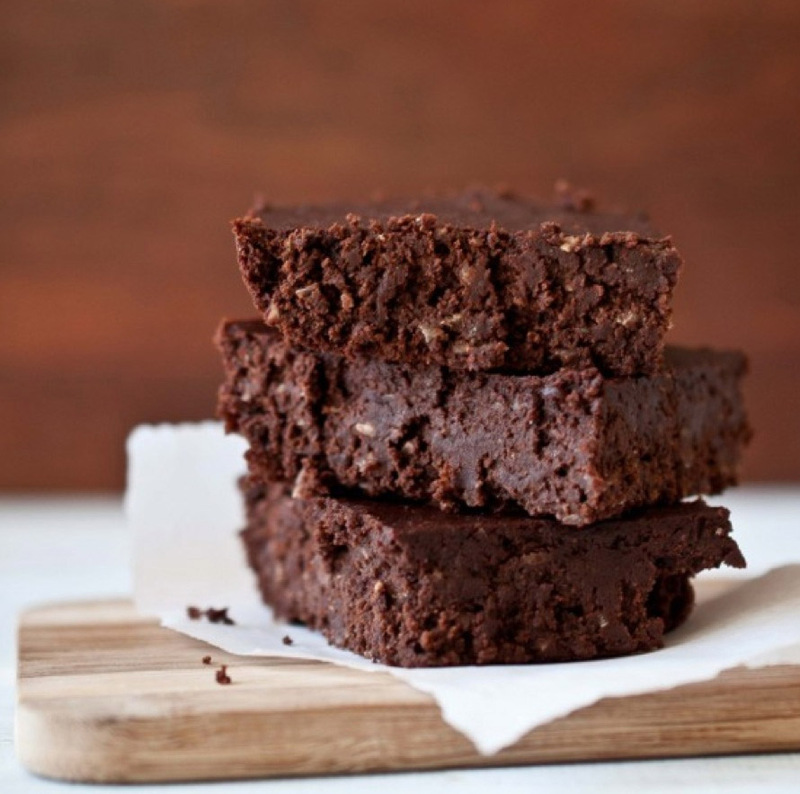 The first brownie recipe was found in a Sears, Roebuck & Co. Catalogue in the 1800’s. Sears’ last general merchandise catalogue was published in 1993. The world’s largest brownie was made in 2001. It weighed in at 3,000 lbs. and was made with 750 lbs. of chocolate chips, 500 lbs. of butter, 850 lbs of sugar, 500 lbs. of flour and 3,500 eggs! There are two types of brownies: fudgy and cake-like. Fudgy tops the preference list of most consumers. Brownie points in modern usage are a hypothetical social currency, which can be accrued by doing good deeds or earning favor in the eyes of another- often one’s superior. The origin of the term is unclear. Although cannabis is the most controversial brownie mix-in, walnut remains the most popular and legal. Typically served as a dessert, brownies can be enjoyed for breakfast or a mid-afternoon snack! Two Day-Red, White and Blue SALE! 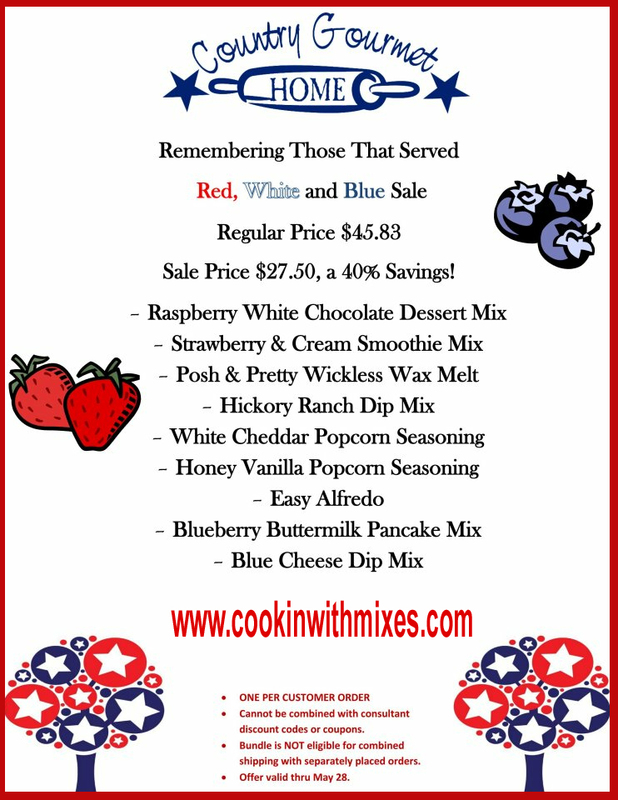 Save a total of 40% on some of our most popular mixes and the bundle includes our newest wax melt scent Posh & Pretty! The sale is located by clicking on Go Shopping then to Monthly Specials on the left side of the page in the categories. Three Dip Mixes for 1 Cent with any $10 order – Awesome Deal for Easter! If you are pondering with the idea of trying out some of the Country Gourmet Home mixes, today would be a good day to give them a try. $0.01 dip trio with any order of $10 or more. Not valid with consultant discounts. ONE DIP SET PER CUSTOMER ORDER! Choose any three dips from the list below. Unbuttered popcorn is a great low-fat snack and can be flavored many ways. Salt and vinegar is a popular flavoring for home-popped popcorn. The idea for flavoring popcorn this way came from traditionalal British salt and vinegar potato chips. Salt and vinegar flavoring can be used on popcorn, chips, french fries or just about any other snack. If you love this flavoring please check out todays deal of the day. If you like salt and vinegar potato chips you will love this popcorn seasoning. I live in South Dakota and luckily I live in the part of the state that didnt fare out too bad but there are parts of the state that have gotten major snow amounts. My prayers especially go out to the families that got affected by tornadoes last night. Every morning I check out my site Country Gourmet Home to see what the DEAL OF THE DAY is. Today is meat loaf and that really sounds good on a cold snowy winter day. You really should check out the Deal of the Day, even I, as a consultant, am not able to take a discount because I am already given such a great deal. Now you may be asking why I would tell you about this when I don’t even get a commision as a consultant but I am all about getting a good deal and want to make sure everyone is aware that this is out there. Just add 2 pounds of ground beef and tomato puree to this mix for homemade meatloaf just like Mama used to make Add Mashed potatoes and green beans for a 70s style dish Variation: Great as a coating for pork chops or chicken. Just put in a bag and shake over some cutlets and bake. Delicious and easy! Please stop by my site and see what looks good to you!